SET IN ONE OF THE AREAS MOST PRESTIGIOUS RESIDENTIAL LOCATIONS THIS VERSATILE FAMILY HOME IS COMPLIMENTED BY BEAUTIFUL PART WALLED GARDENS OF APPROXIMATELY 2/3rds OF AN ACRE.. The impressive and flexible accommodation could suit those who require separate accommodation for relatives, those who work from home or simply want a lovely large family home with space to enjoy together as well as room for peace and privacy. The property benefits from a south westerly aspect with most rooms enjoying views and access onto the adjoining gardens. The accommodation comprises generous reception hall, ground floor cloakroom, lounge, family room two studies, kitchen/breakfast room, utility room, guest bedroom suite and to the first floor five further bedrooms an en suite and family bathroom. Great Amwell - Great Amwell is renowned for its friendly community as well as being an ideal location for access into the neighbouring countryside with many footpaths and bridleways close to hand together with its convenience for the commuter to travel into London with Ware, Hertford and St Margaret's station's all close to hand. Travel Links: - Ideally located amid major trunk roads including A1(M), A10, A414, M11 and M25 and convenient for train services to London Liverpool Street and Kings Cross (Stanstead Express via Broxbourne). Amenities: - Great Amwell is a popular and historic village mentioned in The Doomsday Book. Highly regarded, with properties seldom available, the village boasts an Anglican Church and popular village pub. The George IV, country walks and canal tow path leading into Islington, London. Excellent sporting facilities are found throughout the surrounding area including excellent golf courses. Cloakroom: - Recently refitted with a white suite comprising vanity unit with fitted mirror, low flush wc, majority tiled surrounds, down lights, towel rail/radiator. Lounge: - A most pleasant room with dual aspect over the adjoining south westerly gardens and access onto the patio and terrace by a sliding patio door. Coved ceiling, fireplace housing natural flame gas fire, radiator. Family Room: - An impressive room with vaulted ceilings and triple aspect with patio doors opening onto the rear and side giving direct access to the terrace and rear gardens. Fireplace with electric fire, radiators, double doors leading to breakfast room and kitchen. Study One: - Aspect to front, comprehensively fitted with a range storage units, bookcases and shelving units, inset electric fire and TV, radiator. Study Two: - Accessed from the hallway, with coved ceiling, radiator. Kitchen/Breakfast Room: - Beautifully fitted with a wide range of wall and base storage units incorporating a number of integrated appliances including steam oven, microwave/oven, standard convection oven, together with integrated dishwasher, coffee making machine and wine cooler. Work surfaces with tiled surrounds incorporating ceramic sink unit and breakfast bar, Travertine tiled floor, aspect to rear. En Suite Bathroom: - Refitted with Villeroy and Boch sanitary ware including panel enclosed bath, separate shower cubicle, vanity unit with fitted mirror, low flush wc, tiled flooring, tiled surrounds. 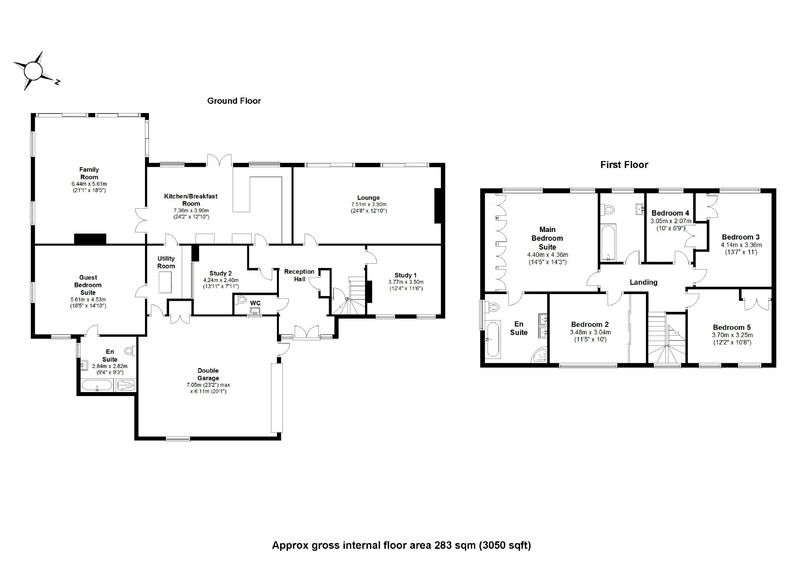 Main Bedroom Suite: - Fitted wardrobes to one wall, aspect to rear over the south westerly aspect rear garden, radiator. En Suite: - Fully tiled floor and walls, twin basin vanity unit, fitted shelving incorporating an illuminated display unit, large shower cubicle, low flush wc, inset down lights. Bedroom Two: - Aspect to front, fitted wardrobe cupboards, radiator. Bedroom Three: - Aspect to rear, fitted wardrobe cupboards, coved ceiling, radiator. Bedroom Four: - Fitted wardrobe cupboards, aspect to rear. Bedroom Five: - Aspect to front, fitted wardrobe cupboards to one wall, radiator. Bathroom: - Villeroy and Boch suite comprising vanity unit, fitted mirror, panel enclosed bath incorporating shower and screen, fully tiled floor and walls, low flush wc, inset ceiling lights. Outside: - Undoubtedly one of the main features of this property is its beautiful setting and heavily stocked gardens with overall plot extending to approximately 2/3rds of an acre. The gardens are walled to one side and have been thoughtfully planted with a variety of shrubs and flowers providing colour for all seasons. The garden enjoys a high degree of privacy by way of natural screening and there is a full width terrace that provides an ideal area for al fresco eating as well as entertaining. The frontage to the property is generous and there is a driveway to a double garage that has electronic up and over doors, power and light connected. Also within the garage is a gas fired boiler which services the hot water and central heating. Epc: - EPC to follow.